Manchester’s Tallest New Skyscrapers …. Plans for a 64 storey tower are submitted, here are proposed schemes for eight of them …. As the city continues to thrust upwards with pace and vigour, proposals for another cluster of skyscapers – the tallest yet – have been put to Manchester City Council. CQ Investments, a subsidiary of Renaker, have lodged plans to construct four glazed towers of 37, 44, 50 and 64 storeys (pictured above) on the site of the Castlefield’s Owen Street car park – between Deansgate Station and Mancunian Way. At just over 200m, the tallest of the Ian Simpson-designed towers would create the fifth tallest building in the UK, dwarfing Beetham Tower at 169m. The ambitious scheme will deliver 1400 new flats for the south of the city centre, alongside a 9,000 sq m public square skirting the River Medlock, an indoor tennis court, swimming pool, spa, gym, cinema and residents’ rooftop café bar with terrace and private garden. Forming part of the wider Great Jackson Street development, construction on the 1.5 hectare site is expected to begin later this year, subject to planning approval, with completion expected by 2020. Though the loftiest, the Owen Street towers are by no means the only sky-high schemes set to transform our city centre skyline in the coming years. Forming the most imposing phase of Allied London’s grand £1.4bn St John’s neighbourhood, St John’s Place will comprise a cluster of four mixed-use towers ranging between five and 50 storeys on Quay Street – the tallest of which will consist of 280 residential apartments and a 180-room hotel. Elsewhere on the St John’s estate, The Riverside phase of 25-acre masterplan will see two more skyscrapers of 30 and 40 storeys constructed further along the River Irwell off Water Street. In March, Renaker submitted plans to Salford City Council for a new 44-storey glazed skyscraper within Salford’s fast-developing Greengate area. Designed by OMI architects, the 350-apartment tower will form a trio of new towers on Trinity Way after Silverlane Development’s 34 and 14 storey Residence scheme – formerly Norton Court – gained approval in December last year (see below). Having received council approval in October, work is underway to convert a former ‘zombie’ car park’ into another Ian Simpson-designed skyscraper just off Mancunian Way. New owners, Bolton-based development firm Forshaw Land & Property, plan to build a 42 storey tower consisting of 420 apartments, alongside ground floor food, drink and leisure units. The new tower will fall just 44 metres short of Beetham Tower. Joint venture partners Bruntwood and Select Property Group have submitted the final applications for their curiously branded £750m Circle Square scheme on Oxford Road – including plans for a 36 storey skyscraper on Charles Street, a central park called ‘The Green’, and a 20,000 sq ft underground concert and events pavilion. 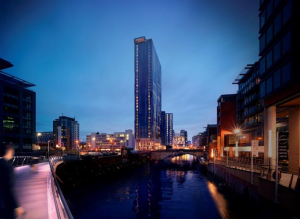 Planning for this 5plus Architects-designed 35 storey tower bordering Deansgate Locks was approved last year, however, developer Brigantes has this month submitted an updated version of the 327-apartment structure to the council following a number of objections. In December last year Salford City Council approved plans to construct two new towers of 34 and 14 storeys beside Trinity Way in Greengate, Salford. Proposed by King Street-based Silverlane Developments and designed by Jeffrey Bell Architects, the two blocks, renamed The Residence (formerly Norton Court), will provide 300 apartments alongside the aforementioned 44-storey Exchange Court (see above). The Elliot Group took control of the project in March. Earlier this year plans were submiited by joint venture partners Bruntwood and Select to construct 506 apartments across two towers of 33 and 16 storeys on a slither of land by The Lowry hotel. Plans include co-working space, a gym, a roof garden and a media room. Works exepcted to begin in October 2016. In March council planning officers approved plans for the 5plus Architects-designed Oxygen, a new 345 apartment residential scheme from the Property Alliance Group comprising three blocks of 31, fifteen and nine storeys, plus twelve ground-level townhouses at the corner of Cross Street and Millbank Street.